Ahmad and Sami are two brilliant minds working to solve social problems in Lebanon. The two Yemeni students decided to tackle the issues of safety and security for refugees who are renting homes in their community because of their own daily struggle and experiences. Before undergoing digital training sessions, Sami had described himself as a ‘lost cause’ in technology. With the support of facilitators from DOT Lebanon through the Generation of Innovation Leaders (GIL) Program by UNICEF Lebanon, he was able to create and promote a business using his newly acquired entrepreneurial skills. Wanting to make a difference in his community, and as a refugee himself, Sami decided to tackle an issue that many refugees face when it comes to renting apartments: landlords in his community had been known to lack transparency, mistreat non-locals, and have even increased rent prices without explanation, taking advantage of vulnerable populations. Sami decided to work towards a solution that would eliminate risks and discrimination for refugees looking for homes to rent. Ahmad, another participant in the course, was inspired by Sami’s vision and admired the opportunities in social media. “I learned how to deal effectively with technology,” says Ahmad. 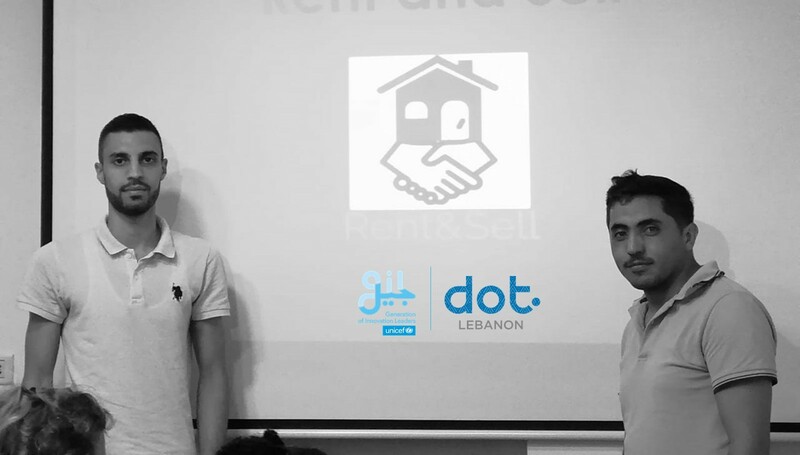 Ahmad and Sami decided to work together to build an online real estate platform, using what they learned through the GIL Program along the way. The two spent 18 hours learning about digital skills with DOT Lebanon through the program, and ultimately created an online business model, advertising strategy for social media platforms, and promotional videos on YouTube. Ahmad and Sami used their new skills and developed business models that leveraged social media to build awareness of issues that refugees face when trying to find, secure, and establish their homes. The two young men hope to share Lebanon’s renting laws and regulations and that their platform will be a successful tool so that both landlords and clients are protected and respected in the rental process. This story has emerged as a result of the UNICEF Lebanon Generation of Innovation Leaders (GIL) Program, implemented by DOT Lebanon with funding from the Dutch and German Embassies in Lebanon.